To provide necessary parallelism between dial surface and indexer, the washer provides additional and adequate material for machining. Aluminum or in some cases Stainless Steel inserts are mounted through the dial table to provide adequate bolt compression resistance and alleviate possibility of bolt becoming loose due to creep. 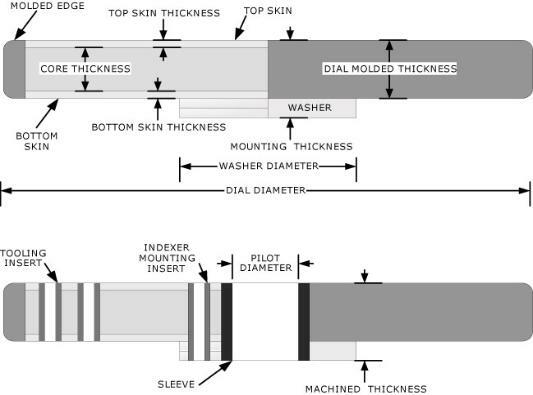 A sleeve is molded within the core of the dial table to provide necessary tolerance for indexer pilot mounting. Tooling inserts can be threaded for mounting tooling directly to the dial table without using the preferred method of through bolts. Indexer mounted with through bolts supported by insert. Tooling mounted with through bolt and nut.